Descent into Bryce — original oil on canvas — 18 x 18 — is one of three paintings by Steve Henderson accepted to the 6th Annual Paint the Parks Competition. Featuring the work of some of America’s top representational painters, Paint the Parks celebrates the beauty of our country’s national park treasures. Joining Descent into Bryce at the Paint the Parks Exhibition are Last Light in Zion and Eyrie, the latter which is also in the Top 50 of Artist and Illustrator Magazine’s Artist of the Year competition. 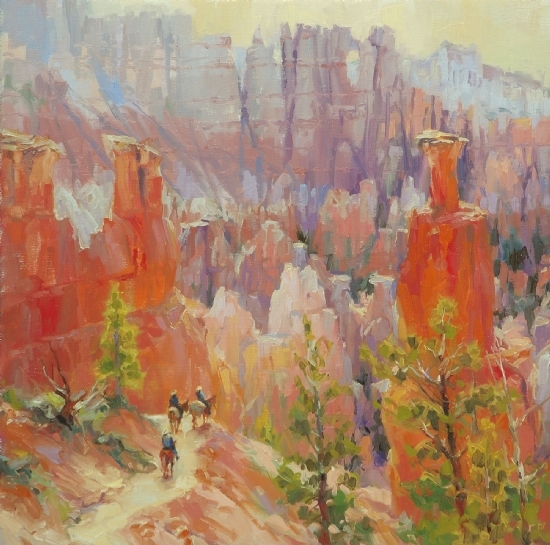 Descent into Bryce is available on the Steve Henderson Fine Art Website as signed, limited edition prints of varying sizes and prices, framed and unframed, and shipping is free. Heading to Bryce Canyon National Park? Whether your summer vacation plans include an actual visit to Bryce Canyon, or consist of vacationing at this National Park treasure in your mind while you tan on top of the trampoline, Descent into Bryce will take you there, again and again, from your living room sofa. Summer, and all of its joyous fun, lives on through visual art. Available as a signed, limited edition print in two sizes, Descent into Bryce comes framed and unframed, and starts at $55. Shipping, as always, is free. Visit Steve Henderson Fine Art to find the perfect painting for your wall — whether it is an original oil or watercolor, a signed limited edition print, a miniature study, or a note card. Art is priceless, but it doesn’t have to be priced out of your reach.